It all came to a head when I went to a meet up last year and came home with literally a month’s worth of sheet masks. Before this event, I had a few sheet masks that I’d purchased but rarely used them. To be honest, I found masks to be a bit of a faff. And while I generally liked the results I had the day after use I just couldn’t be bothered using them. Relaxing for 20 minutes wearing a sheet mask and then having to get up and finish the rest of my skincare routine was my biggest issue. Closely followed by using a few masks that annoyed the hell out of me because they were so wet they just slipped down my face the whole time. How did I get from that, to using one each day for a week? I’ve been on a bit of a mission recently. I have so much stuff. Whether it be crafting supplies, beauty products or planner stickers I have way more than I need. So, I’ve set about either destashing or using up my overstocks. Alongside this I’m doing a bit of a no buy. This involves only purchasing to replace something I’ve run out of basically. When it came to beauty overstocks, my biggest one was sheet masks. I decided to start using them more and started off weekly. Between using a simple routine afterwards of just eye cream and moisturiser and trying some new masks that my skin really liked I started to enjoy using sheet masks more. To test out the real effects of regular sheet masking I decided to try it every night for a week to see how my skin looked and felt. I recorded which ones I was using each night over on Instagram Stories so you if you follow me over there, most of these probably aren’t a surprise! To give you some context to my current skin, I’d just been recovering from a bad breakout. I had stripped back my routine for a week or so and was just beginning to add Vitamin C back in. Here’s my AM and PM routines for the week of masking. I kicked off the week with a sheet mask I’d already used before as I received a whole pack of them at the meet up last year. Helloskin Jumiso Sheet Mask. I really like this mask. It’s not too wet and so doesn’t slide down my face and is easy to apply. The next day my skin looked calm with spots a little faded looking. This is one of five available masks from Hello Skin, and I’m keen to try more after using these. This one is called Chewy and is for elasticity. Thanks to the collagen and jojoba oil inside I did feel like my skin felt bouncier the next day. Other kinds available are nourishment, soothing, lightening and splash (which I take to mean hydrating). At £2.75 each they’re a decent price and slightly cheaper if bought in a bundle. The mask I pulled out for the second day of sheet masking I was dubious about. Neogence Bird’s Nest and White Fungus Moisturising Mask. Bird’s nest. Really? On opening the packaging I found a nice black mask, that was a thicker material than I’m used to. It just felt a such higher quality than other sheet masks I’ve used before. It was super easy to get on, not too wet and really comfy to wear. The next day my skin looked and felt really good. Calm, soft, and a little bit brighter. I was really impressed. Definitely moisturising as the name says and an all round really nice mask. I couldn’t find these on any UK sites other than eBay and on there they’re around $2 each. Very cheap and definitely worth it for that price. This was another mask that came from a pack. This was the Instytutum Flawless Skin Mask. I opened this up and found that the mask came in two pieces, and had that horrible plastic back masks sometimes have. So not only did I have two bits of mask to faff with, I had to peel off a backing. Not a great start. Then I realised why it had the backing. This is not your usual mask, in that it’s actually a gel mask, not unlike hydrogel eye patches. The parts of the mask were quite a lot bigger than my face so there was lots of overlapping and folding over of it. This is pretty standard for sheet masks for me, but because of the gel I think I noticed it a lot more. However, wearing the mask was in general pretty comfortable. The next day I didn’t see much difference in my face. If anything, I saw a few more pockets of PIE that wasn’t there before. There definitely wasn’t the immediate tightening effect that the product promised. Nor did my skin look flawless the next day. I’ve got a few more of these to try so I’ll reserve total judgment for then. However, at $79 for a pack of five, I don’t see myself dashing out to buy these anytime soon. Next up out of my stash was the KinGirls Raspberry Extract Invisible Face Mask. Another mask I was dubious about. No mask is invisible, particularly not a sheet mask. It also had some weird text on the packaging: ‘Good masks are like freshly baked macarons.’ What? Anyway onto the mask and another one with terrible plastic backing. This is just a normal sheet mask so I really don’t see the need for such unnecessary packaging. Once I got the backing off this application was okay although the eye and mouth holes both needed stretching out as they were way too small for my face. The next day I again didn’t see much difference in my face other than a new small spot and a couple of others that looked ready to surface. This mask claims to only contain essential oils and they don’t always play well with my skin, so that could have been reason that my results weren’t that great. At $6 each I won’t be trying these again. By the fifth day I was really starting to look forward to going through my stash and selecting a new mask. By doing this I was reminded of the A. by Bom masks that I had and had never tried. I’ve heard only good things about these masks so I was excited to try one! These are the first masks I’ve seen that come in several steps. This one has an eye serum, moisturiser and then the usual mask. Interestingly, that’s also the order is says to use them in. I found this strange as I always consider moisturiser to be a barrier but I followed it anyway. The eye serum was very sticky and you got a lot of it. However the moisturiser felt nice on the skin and wasn’t overly scented. The mask itself was easy to use, if a little wet. It did feel like it was sliding down my face during wear. The next day though I was impressed. The spot that popped up the previous day had disappeared, and the ones that looked like they were threatening to come through, had faded away. At $4.50 they’re not bad to say they come with multiple stesps. I’d definitely pay that to use them again. I took delivery of some new sheet masks during this week of masking as part of the Skinsider reviewer program. As these were new to my collection, I had to try one this week. Two things struck me when I opened this mask up. One, it was black and two, the material it was made from felt amazing. It was just super soft and a little thicker than normal. It was quite wet and a little slippy but applied nicely. The fit was also one of the best I’ve found. It wasn’t massively bigger than my face and so there were very few areas where it was folded over or lumpy. This mask is all about hydration and contains five different kinds of hyaluronic acids. The serum was good and thick and left my skin feeling really plumped up afterwards. I actually used the remaining serum in place of my usual essence the next morning. The next day my skin looked nice and calm and the redness of the PIE was faded more than the previous day. After six days of masks my skin was in such a good place I didn’t wear foundation that day, just BB Cream. At £3 each they’re not the cheapest on this week’s list but I’d definitely purchase them for future use. Last of the masking and it was the turn of Cosmetea. A brand I’d never heard of but discovered at last year’s K Beauty event. The clue is in the name, but this mask contains tea and is all about hydration. This was a pretty standard mask to use. Felt quite wet to apply but didn’t slide down my face at all during use. Was a good size and fit me rather well – one of the best fits of this week. Unfortunately though it irritated my eyes during wear. They stung and were runny for most of the time I was wearing this. The following morning I didn’t see anything extraordinary results-wise, in fact my face was redder and slightly itchy. The PIE looked angrier than the day before, too. This is available on ASOS for £4 which is steep. I found it for half that price on Rose Rose Shop. I probably won’t be rushing out to try one of these again though. 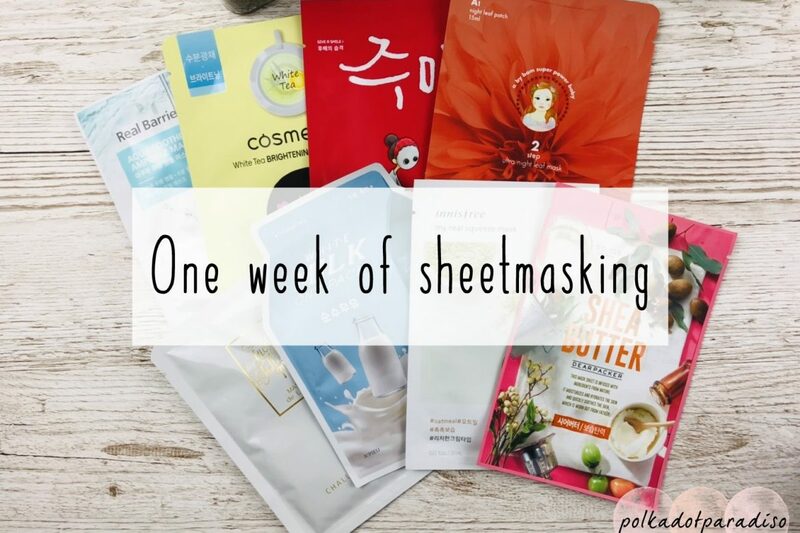 How was my skin after a week of sheet masking? This past week has been a real eye opener in terms of how wrong I was to neglect sheet masks for so long. It also gave me a massive insight into how much hydration really affects acne prone skin. It’s so easy to get caught up in attacking acne whereas this week has shown that if you just give it some intense hydration (most of the sheet masks I used this week were for hydration) you’ll see some fabulous results. So much so that I actually felt confident enough to share (an albeit poorly lit) foundation-free picture on Instagram! FYI: The best BB Cream for foundation-free days! You could say I’m a massive convert to sheet masks now and this week has been great to quickly find the brands to keep purchasing from. Highlights from the week definitely were the Neogence, Helloskin, Real Barrier and A. By Bom. Before now I used to just pick up cheap Innisfree and Etude House masks during my regular Jolse order. Now I’ll be a bit more selective about what I add to cart. I hope this week of masking post was helpful! With so many more masks in my stash to try I’m tempted to make this a regular post. If you’d be interested in more mini mask reviews, let me know in the comments!